Please be aware that the articles in this series are merely an introductory overview on the topic. More plausible implications of the astroshamanic voyage through the Tarot are provided with individual experiential sessions or specific training. 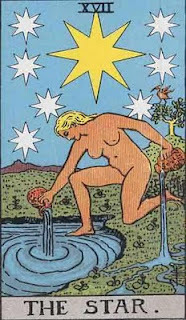 The Star is the seventeenth trump of the Major Arcana, which in most traditional decks is associated with Aquarius. In the Rider Waite Tarot the Star depicts a naked woman kneeling by a pool of water, with one foot in the water and the other on the ground. She holds two jugs: one in her right hand, from which she pours a liquid into the water, and one in her left, which she uses to pour the liquid on the earth. In the background a bird stands on a tree, while above the woman there is a large eight-pointed star, together with seven smaller stars, making a total of eight stars. From a Gnostic perspective the eight stars represent the eight starry spheres beyond the visible planets, the gateway to Heaven and what lies beyond human awareness. In this respect the naked woman relates to Sophia, a representation of the human soul in its purity, the ultimate and lowest emanation of God, and the mystical Bride of Christ. By pouring water on the land and on the pool the woman shows mastery in the shamanic art of combining polarities, which is what finally allows true ascension to higher realms. Following the stormy features of the Devil and the Tower, the Star brings a radical soothing shift, which provides an inevitable sense of calm and relief. It heralds the end of a time of turmoil and the return of peace and stability. Death here is death of the personality, the ego identity based on false perception and separation. It is not necessarily a physical death, but rather a moment of epiphany in which what was obscured by the ego finally emerges, providing a sense of unexpected relief, balance and harmony. The storm may come again, and yet the Star brings increased awareness that the space of calm will return and that its presence can be ongoing if we learn to remain connected. 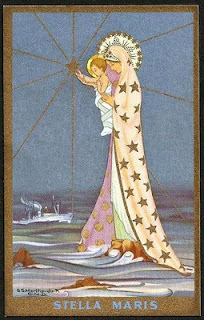 The Star is generally a most attractive card, which most people love, for it provides an immediate sense of healing and peace, suggesting unexpected help, or a gift often coming out of the blue. As a result, it is welcome in readings, especially in times of pain and darkness. Since the Star is far away in the sky, it does not necessarily provide practical solutions to earthly issues, which are likely to remain troubled unless we take pragmatic action. Yet the Star brings the gift of hope, blessing and inspiration, which are surely a most motivating point in order to promote practical actions. Hence when the Star comes in a tarot reading this can be a sign that we are on the right track and also that our intentions are blessed. And yet, in order for these intentions to be manifested we need to move further, embracing the blessing and doing what is needed. During the recent New Year Spiritual Healing Retreat at the Findhorn Foundation in Northern Scotland, we held a ritual on the 1st January, which in the Catholic calendar is a solemnity devoted to Mary, Mother of God. On that occasion each participant established a connection with their own star. According to many legends there is a star that shines for each one of us throughout life and also shows the way back home when life here is over. This New Year ritual was accompanied by the sound of many versions of Stella Splendens, a popular round dance polyphonic song from the Llibre Vermell de Montserrat. We were born from the stars, and the connection with the starry realms allows us to be linked to our original home, where we come from and our primary intention. The power of the stars is the element of transformation of the whole universe and stars operate as teachers, educating us to move on and renovate ourselves. I would like to dedicate the song “Stella Splendens” (click here for a video-clip) to all the readers of this blog. I devote it to all those who never cease to be enamoured of the Star(s) and constantly hold her (their) tender and passionate embrace with the Earth. I also devote it to those who have provisionally lost their love for the Star(s), knowing that this love keeps being available at all times, up in the sky and in the reflection of the stars down on the earth, and inside ourselves. After all, as Des’ree sings in "What’s your sign?“ "in this great big universe, we are the stars on earth”. For a music video of “What’s your sign?” please click here. I am so passionate about “Stella Splendens”! Only by listening to a little bit of its music stars begin to vibrate within and without me, spontaneously, with no effort. Yes, because, whether we want it or not, we are made of stars, and no matter if we get trapped in the marshes of our gloomy thoughts, stars continue to shine the light of whom we truly are. And then, if I also dare to dance this music, well, what comes is everything that I have always wanted to write about stars (but were afraid to tell). Please click here for another version of “Stella Splendens” by the Catalan group Companyia Electrica Dharma. 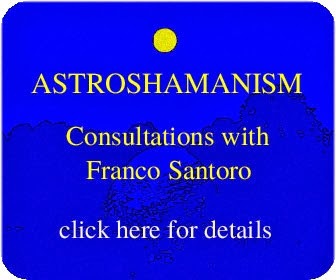 Bookshop: see: http://astore.amazon.co.uk/astroshamanis-21?_encoding=UTF8&node=1, here you can find many book and dvd recommendations, and also order items online via Amazon. Ordering items through this link is a way of supporting our work.